Two epic battles between Johny Hendricks and Robbie Lawler for Welterweight gold were the focal point of the year. 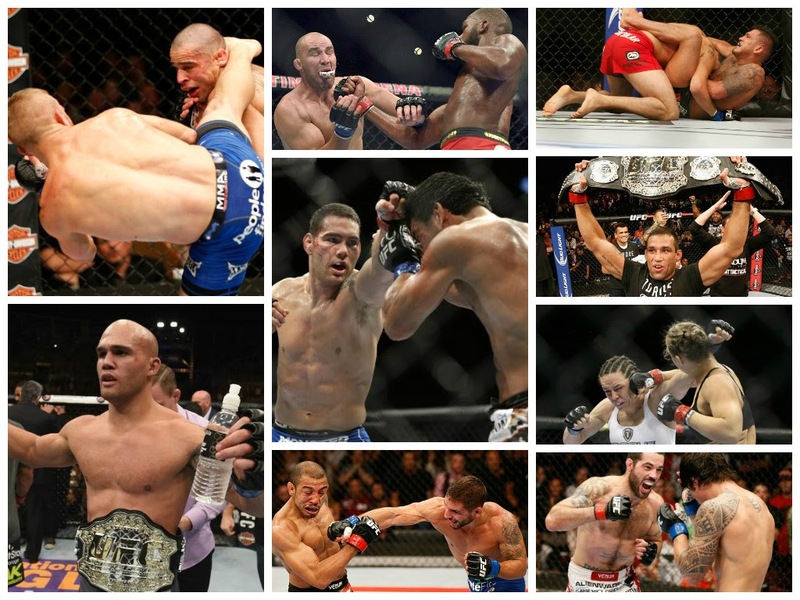 46 nights, 503 fights, an abundance of delights and some plights—2014 was another whirlwind year in the UFC. Despite being nagged by a plethora of injuries leading to some weakened cards, through all that overhaul of chaos delivered those moments which made fight fans proud. We review the year of 2014 in UFC in it's entirety, as Nisar Khan breaks down the story of the year, before MMA Genius pinpoints his expertise to the inaugural TSM UFC Awards. Singapore provided a scintillating backdrop for the Octagon's first outing of the calendar year. Tarec Saffiedine threw all he had at fellow Welterweight Hyun Gyu Lim, but the determination of the South Korean meant he would not go down without a fight. He didn't get the win either, but his resilience was a focal point of many fight fans' admiration. Luke Rockhold proceeded his meteoric rise by dispatching Constantinos Philippou in Georgia less than a fortnight later. A body-kick midway through the first round put it all in favour of the former Strikeforce Champion, while TJ Dillashaw and Yoel Romero were victorious further down the card. Benson Henderson made his return to action as the UFC braced the Windy City. Under the lights of Chicago's United Center, "Smooth" failed to convince as many as he limped his way to a split-decision victory that really could have went either way. An evenly-tilted battle over the five rounds saw him pip Josh Thomson but his future was still in limbo. On that same night, Donald Cerrone landed flush with a head kick to dispatch Adriano Martins. With the tone set after January's fights, it was now time for the first PPV of the year to take place. On SuperBowl weekend, two titles were on the line as Nova Unaio Champions invested their fates in New Jersey. Jose Aldo breezed past Ricardo Lamas for a lopsided decision, before Renan Barao once again finished Urijah Faber with a TKO to maintain his stance atop the Bantamweight division. Lyoto Machida embraced a victory on his home soil, outclassing Gegard Mousasi in Jaraguá do Sul, Brazil. On the same night, Ronaldo Souza opened his contender-bid year with a clear decision over Francis Carmont. Another PPV in February would see two TKOs take the spotlight. Daniel Cormier dismissed newcomer Patrick Cummins after Rashad Evans pulled out due to injury, then Ronda Rousey brushed aside title contender Sara McMann, scoring the first TKO of her professional career. One of the knockouts of the year emanated from China in the TUF Finale. Dong Hyun Kim landed an outstanding spinning back elbow to put away British fighter John Hathaway. There was also a dosage of heavyweight action with Matt Mitrione proving a class apart from Shawn Jordan, knocking him out in the final seconds of Round 1. All eyes would then be on London, as the UFC took centre stage in the O₂ Arena, as Alexander Gustafsson emphatically finished Jimi Manuwa in the second round of a huge Light Heavyweight bout. The Swedes turned out in numbers to cheer Gustafsson and he delivered on all quarters to become the prevailing European. 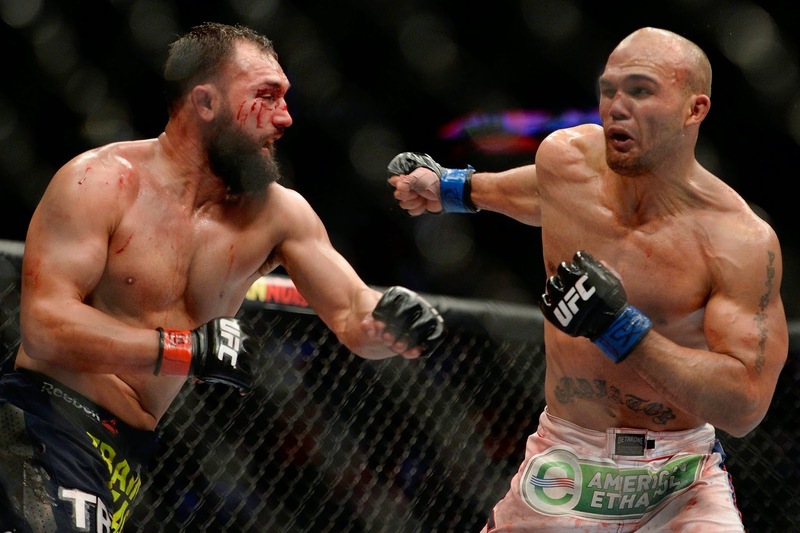 One of the fights of the year took place in Dallas' American Airlines Center as Johny Hendricks edged Robbie Lawler in a thrilling battle to capture the vacated Welterweight title. A heavy-hitting bout saw both withstand one another's power and trade until the fifth and final round, where the fight still hinged in the balance. Hendricks won that round, ultimately getting his hands on the Gold, although a rematch later on in the year would undo that. A rare card of Sunday night fights from Natal, Brazil pitted two UFC veterans against one another, in a rematch from their 2011 fight of the year. Dan Henderson, again, was the victor but this time it was through unleashing one of his renowned right-hand bombs to drop the Brazilian and score a 3rd round TKO. As the UFC continued to venture on an International scale, Abu Dhabi was next to be thrilled. Roy Nelson dominated, then destroyed Antonio Nogueira in the course of one round. "Big Country" had his counter-part dazed from the outset, before a one-punch knockout brought an end to the festivities in a humid du Arena in April. Michael Bisping made a return to action a few days later, looking to settle his bad-blooded rivalry with Tim Kennedy. In the TUF Nations Finale, however, it wouldn't go the Brits way, as he was frustrated by the rugged wrestling of Kennedy, ending in a unanimous decision win. #1 contendership for the Heavyweight title was on the line as Fabricio Werdum met Travis Browne in UFC on FOX on April 19. Browne was coming off a drastic ascension to a potential contender status, but he came against an unstoppable Werdum. The Brazilian withered Browne, taking away his advantages in the fight and establishing himself as a true contender. Jon Jones then stepped in to defend his Light Heavyweight title against Glover Teixeira, who at the time was undefeated inside the Octagon. Despite possessing a huge threat in bouts prior to the title fight, Jones was no match for Teixeira, keeping a great distance apart to shut down the challenger and maintain his title reign. Matt Brown kickstarted a huge year with a TKO of Erick Silva. UFC Fight Night Cincinnati featured a plethora of underdog wins proving to be one of the cards of the year. One of the most shocking yet greatest performances of the year came from UFC 173. Renan Barao went into the fight untouched and hardly tested so far, but when the underdog TJ Dillashaw came along, he put on a performance of a lifetime to eventually finish the Bantamweight Champion in the fifth round. A back-to-back special of events on 31 May saw Stipe Miocic knock out Fabio Maldonado in the TUF Brazil finale creating shockwaves as he dispatched the resilient and heart of his opponent. In Berlin, another first-round finish was in store in the main event as Gegard Mousasi choked out Mark Munoz demonstrating his swift submission skills. A week later in UFC Fight Night New Mexico, Benson Henderson scored an atypical finish as he submitted Rustam Khabilov with a rear-naked choke. Diego Sanchez, in the co-main event, controversially saw off Ross Pearson by split decision in one of the worst decisions in UFC history. Flyweight John Dodson continued his resurgence, pummelling John Moraga to the extent of a doctor stoppage. UFC 174 saw Demetrius Johnson further solidify his Flyweight supremacy easing past Ali Bagautinov during a unanimous decision victory. Rory McDonald, Ryan Bader and Andrei Arlovski were also victorious through decision wins, after Ovince St.Preux forced a verbal submission from Ryan Jimmo. Another double-header on 28 June saw Cub Swanson outclass Jeremy Stephens, while Kelvin Gastelum continued his rise topping Nico Musoke. Over in New Zealand, Nate Marquardt won on points against James Te Huna. Chris Weidman made the second defence of his Middleweight Championship edging an epic battle against Lyoto Machida. The Brazilian was just short of capturing the Gold, with Weidman disproving critics as he stood toe-to-toe with the veteran. Ronda Rousey made much quicker work in her title defence, dismissing Alexis Davis in 16 seconds, enough to fit in an Instagram video. Frankie Edgar and BJ Penn went at it for a third time to conclude their trilogy and TUF 19 a night later in the same arena. A relentless pace set by the former saw Penn have no response, and the referee would stop the fight in the third round. Finishes were guaranteed when Lightweights Donald Cerrone and Jim Miller threw down in Atlantic City. A head-kick KO from Cerrone dispatched Miller at ease while earlier in the card, Edson Barboza followed up an excruciating liver kick with a flurry of punches to defeat Evan Dunham. Three days later, the UFC continued it's global tour to Dublin. Conor McGregor and his fans packed the stands as he welcomed Brandao to a hostile environment at The O₂. The Irishman would blow the roof of the place in his home soil with a first-round TKO. A chance at Welterweight No.1 contender-ship was up for grabs as Robbie Lawler looked to bounce back against the high-flying Matt Brown. A great fight saw Lawler pip his counter-part in a war in San Jose. Also on the card, Anthony Johnson waltzed past Antonio Nogeuira, while Denis Bermudez tapped out Clay Guida. After UFC 176 at the Staples Center was scrapped, fight fans had to wait 20 days for the next card. It was worth the wait though, as Ovince St. Preux defeated Ryan Bader over the distance along with Ross Pearson knocking out Gray Maynard. Tim Boetsch demonstrated some inflicting power as he finished Brad Tavares in the same fashion. Rafael Dos Anjos had a huge 2014. An exclamation mark on that was finishing Benson Henderson in Tulsa, Oklahoma. A ferocious pace from RDA would see him drop "Smooth" before a bombardment of punches brought an end to the contest in August. On that same day, Michael Bisping put away Cung Le in China. The Brit landed a knee and a few punches after both traded wildly to finally dispatch Cung Le, although he did show some resilience to weather the early storm in Macau. The final event of August, or the summer so to speak, was a rather subdued UFC 177. An injury forced Cariaso vs. Johnson into another card so it was rather diluted. Barao was set to rematch Dillashaw for the title, but the ex-Champion passed out during a weight cut meaning a newcomer Joe Soto stepped in to challenge. Considering it was one of the weakest PPV cards in history, it delivered to an extent with Dillashaw eventually finishing Soto in the fifth round following a head kick. A fiftieth instalment to UFC Fight Night in Conneticut would prove to be a spectacular one. In the main event, Ronaldo Souza elevated himself to contender status submitting Gegard Mousasi in the third round to make huge statements. Ben Rothwell knocked out Alistair Ovrreem, Mitrione did the same against Lewis, while Joe Lauzon forced a doctor stoppage to Michael Chiesa on the same night in Foxwoods Resort Casino. Antonio "Bigfoot" Silva headlined the UFC's first event in the capital of Brazil as he rematched Andrei Arlovski. With the Brasilia fans behind him, Bigfoot looked to emulate his victory when they last met under the Strikeforce banner, but the arena would be lethally silenced when Silva was dropped by a huge punch, followed up by the TKO. Mark Hunt and Roy Nelson were both fighters whose styles were parallel. Fans had been calling for this fight for a long time and finally got it in Japan. With power to end the fight at any second, Mark Hunt scored a Round 2 walk-off knockout as he dropped "Big Country" with an overhand right. While a title fight for the Flyweight strap was the main event of UFC 178, between Demetrius Johnson and Chris Cariaso, all the headlines would occur way before that. Before Johnson retained with a second-round Kimura, Eddie Alvarez's UFC welcoming party was foiled by Donald Cerrone. Earlier, Conor McGregor and Dustin Poirier went at it in one of the most-hyped fights of the year. All the trash talk would come down to Conor McGregor finishing Dustin Poirier in the first round and continue his climb to stardom. Rory MacDonald embraced a sweet victory within the confines of his home nation prevailing over Welterweight Tarec Saffeidine in Canada. MacDonald took home a Performance of the Night bonus for his third round stoppage, as the referee culminated the fight following a barrage of punches. Earlier, Raphael Assunção notched a points win over Bryan Caraway. Venturing back onto European soil again, UFC Sweden witnessed one of the biggest upsets of the year. Rick Story became the first man to defeat Gunnar Nelson as he rose to the occasion, even breaking his ankle in the first round, to triumph by split decision. Max Holloway knocked out Akira Corassani in the co-main event. Again, Jose Aldo and Chad Mendes met in the Octagon. Again, it was in Rio de Janeiro. Again, Jose Aldo would walk out the Champion - but he would require a gutsy uphold in one of the fights of the year at UFC 179. After their August showdown was delayed, Chad Mendes threw all he could in order to seize the Featherweight strap but he would be edged by the Brazilian. Back in Brazil just a few weeks later, the Octagon took to Uberlândia. Mauricio Rua was looking to bounce back on home turf against Ovince St. Preux of who had been ascending drastically over the year. Things would swing in the favour of the latter who landed flush on the chin of Rua, before finishing things off. The fight was done in 34 staggering seconds. Sydney, Australia was host to the most phenomenal UFC card in recent memory. Judges were not needed as all 11 fights ended in finishes, including Luke Rockhold who prevailed from his bitter rival Michael Bisping. He rocked the Brit early on, and eventually capitalised to vice in a rear-naked choke and have the much-needed bragging rights. Another injury to Heavyweight kingpin Cain Velasquez meant he would not feature in the UFC's first event in Mexico. Instead, Fabricio Werdum and Mark Hunt contested for the Interim title. Werdum was irritated early as Hunt searched for the overhand right. At times, he was caught, but not enough to dictate the fight. One opening though, and the Brazilian capitalised. In the second round, Werdum dropped his counter-part with a knee, following to the finish. Kelvin Gastelum also impressively finished Jake Ellenberger with a rear-naked choke. With the Featherweight scene continuously exploding, veterans Frankie Edgar and Cub Swanson met with huge implications. The final result saw Edgar score the latest finish in UFC history. After pummelling and dominating Swanson for the whole five rounds, he managed to cap it all off in the dying seconds. Another epic battle saw the Welterweight strap change hands in the final PPV of the year at UFC 181. Two titles were on the line. First, Anthony Pettis made his first defence of the Lightweight title, locking in a guillotine to put away El Nino. On that same night, it was announced that CM Punk would be joining the UFC. Along with that there was some hard hitting Heavyweight bouts as Travis Browne and Todd Duffee both got done within a round of fighting. In the main event, Robbie Lawler captured the Welterweight title by split decision and it was another terrific instalment. Ultimately, it would be a razor-close call. History was made when Carla Esparza became the first Women's Strawweight Champion in UFC history. A rear-naked choke in the third round to Rose Namajunas would spark the triumph as The Ultimate Fighter series concluded. It was another fight-weekend as the next night, Stipe Miocic put on the performance of the career and pushed Junior Dos Santos to the limit. In a huge UFC on FOX card, the returning Dos Santos found himself in trouble from the Croatian, but once again some controversial judging would see in the favour of the former Heavyweight Champion. Dos Anjos dominated Diaz, and Overreem finished Struve in the fights prior. The curtain would draw on the year in Barueri, Brazil. Lyoto Machida needed just over a minute to dispatch CB Dolloway, with excruciating body kicks followed up by punches were enough for him to win in front of a home crowd. Renan Barao was also flying the flag for his nation, competing in his first non-title fight in years, submitting Mitch Gagnon with an impressive arm triangle. With that, 2014 in the UFC was a wrap. 46 events, 503 fights, 16 title fights and many moments once again to savour. But, with an abundance of Octagon action bombarding, it was hard to keep up, and many debated that the quality of fight nights were drastically plummeting. At times plagued with injury, it was far from the best, but it still will remain in our memories. One thing is for sure, though. UFC will open up 2015 with a bang. Varner vs Trujillo was a wild and action packed brawl. Varner controlled most of Round 1, but Round 2 was arguably the craziest round of the year. Trujillo got caught with a left hook and was rocked, but he still threw power punches. Varner was trying to finish but got careless and got caught with a vicious overhand right putting him to sleep. Hendricks vs Lawler 1 was an intense battle. Hendricks landed some strong leg kicks and combos in rounds 1and 2. At that point, fans thought Hendricks would cruise to victory, but that was not the case. Lawler came back storming with punches winning round 3 and 4. It all came down to the final round where Hendricks was able to get a takedown to secure him the win and the championship. This was a wild crazy scrap as well. Silva started of strong hurting Brown the body, but Brown came back literally manhandling Silva around the octagon. Brown eventually broke Silva getting the tko victory. Brown's hometown crowd played a huge role in willing him to victory. Winner: Hendricks vs Lawler wins due to the implications of the fight. Kim caught Hathaway with a beautiful spinning elbow that put John's lights out. This KO literally had me jumping out of my couch. Beal executed the perfect flying knee on Williams leaving him unconscious. This KO made the Sportscenter Top 10 plays as well. In the epic rematch between these two legends, Shogun was in control of the fight rocking Henderson a couple of times until Hendo landed his signature H-Bomb, putting Shogun on queer street. Hendo broke Shogun's nose as well, and earned one of the biggest wins in his career. Winner: Dong Hyun Kim KO victory of John Hathaway. How many times do we ever see guys get KOed by spinning elbows? Kim takes the award! This choke was only completed once in UFC history before OSP pulled it off. OSP was in side control and Krylov grabbed on to a guillotine, but OSP used it to set up the Von Flue putting Krylov to sleep. Rockhold set this up beautifully. After a scramble with Rockhold on top in north/south, he triangle his legs trapping one of Boetsch's arm. Rockhold had two submissions locked up. Boetsch couldn't last long has he tapped to a nasty Kimura. Ben Saunders pulled off the first ever omoplata finish in the UFC. Heatherly's arm was in severely painful position. All that training with Eddie Brava paid off for Saunders. Winner: Ben Saunders' omoplata over Chris Heatherly. Hardly anybody picked Story to beat Nelson in Sweden, but Story rose to the occasion and took it to Nelson. Story arguably won every round, and the crazy thing about it was that Story broke his ankle early in the fight. The win launched Story back into contender status and he is the only man to beat Nelson. Most fans expected rising star Al Iaquinta to run right through Clarke and after a dominant first round it was evident that was going to happen. Iaquinta made one slight mistake on top in Round 2, and Clarke slapped on a D'arce choke putting Iaquinta to bed. Barao was viewed as the Pound for Pound best fighter in the world by some fans and Dana White heading into his fight with TJ Dillashaw. Not to may people picked Dillashaw to pull off the win, but the fans were in utter shock after this fight. Dillashaw picked Barao apart with ease and finished him off in the 5th round becoming the champion. Winner: TJ Dillashaw defeats Barao to win Bantamweight title. Cordeiro made a huge leap in 2014. The striking coach for guys like Fabricio Werdum, Rafael Dos Anjos, and Lyoto Machida proved he was an elite coach in MMA. He has one interim champion and two guys on the verge of title shots. John Kavanaugh and his crew of Irish fighters like Connor Mcgregor, Gunnar Nelson, Cahal Pendred, Paddy Holohan, and Aisling Daly hit stardom in 2014. Mcgregor practically has taken over the UFC's 145 division as well. The dutch striking coach Hooft proved he was a mastermind when it comes to striking. Responsible for the resurgence of guys like Vitor Belfort, Anthony Johnson, and Eddie Alvarez. 2015 should be a big year for his fighters. Rafael Cordeiro with Shogun Rua. ATT has become a powerhouse of MMA training with tons of elite fighters trainng there. Champs like Robbie Lawler train there, and contenders like Lombard, Woodley, Poirier, Lentz, and Masvidal Train there. ATT has the most u ranked guys in their gym as well. The SBG Ireland crew only lost 2 UFC fights all year. Mcgregor skyrocketed up the ranks at 145 and his crew isn't too far behind him. Rafael Dos Anjos said the reason of his success was due to his training at Kings MMA and the coaching staff. Fabricio Werdum is now the interim champion, and Lyoto Machida is still improving at 36 years old. Up and coming guys like Beneil Dariush are in the great camp as well. Myles Jury is only 26 and has already beat guys like Diego Sanchez and Takanori Gomi. Already the #8 guy in the world. Jury has a big task in front of him in Donald Cerrone. At 23 years old, Gastelum beat tough vets like Rick Story and Jake Ellenberger in 2014. Gastelum is already a serious contender and he has his biggest test to date in Tyron Woodley coming up. Romero isn't your typical "prospect" at 37 years old. Scoring wins over Derek Brunson, Brad Taveras, and Tim Kennedy launched Romero into contender status at 185. Now Romero has possibly a #1 contender fight on his hands with Jacare Souza. This was the worst decision in the history of the UFC. Pearson clearly won all 3 rounds and was robbed of a victory. The UFC later came out and said they would move on as if Pearson won the fight and gave him his win bonus. Sanchez has arguably lost his last 6 fights. Diaz only fought once in 2014 due to contract issues about money. He returned to fight Rafael Dos Anjos at UFC on Fox Phoenix and missed weight by 4 pounds and got dominated. Diaz had no one to blame but himself for his career down slide. Diego Sanchez is one of the most popular fighters in the UFC, but it seems as if he is only getting worse and worse. In my opinion, he has lost his last 6 fights including bad decisions against Kampmann, Gomi, and Pearson. Sanchez is in desperate need of a victory in 2015. Winner (or loser? ): Diego Sanchez def. Ross Pearson, "the worst decision in the history of UFC". You could hear the energy of the crowd in Dublin through your computer or television. The support that the Irish fighters got was remarkable and they were almost invincible in the cage. Irish fighters McGregor, Pendred, Parke, Seery, and Holohan all won their fights and the crowd exploded. I am a big fan of finishes and the Atlantic city card had 12 out of 14 finishes. Great fights like Lineker vs Özkılıç were on the card and a series of TKO's happened on the main card. Every fight on this card ended in a finish. Enough said. Lawler finally got his coveted UFC title. After loosing to Hendricks at UFC 171, Lawler stayed active and went on another run. He defeated Ellenberger and Matt Brown to earn him a rematch. Although the second fight with Hendricks was controversial, he still captured the title and completed his career resurgence. Dillashaw did the unthinkable by beating by beating Barao at UFC 173. When Barao pulled out of their UFC 177 rematch, He fought Joe Soto on 24 hours notice and did not complain. Aldo could have let the Nova Uniao/Team Alpha Male beef get to him at UFC 179, but he handled business and beat Mendes for the 2nd time. Aldo is arguably the Pound for Pound Best fighter in the world. Rousey had her typical year by destroying Sara McMann and Alexis Davis. She looks unbeatable at this point. Esparza proved she was the best 115 pounder in the world by making her way through the TUF house. She defeated Tecia Torres, Jessica Penne, and Rose Namujanas to become the first ever UFC straweight champ. Zingano had a tumultuous 2013 and 2014. She tore her ACL and lost her husband. Those injuries and losses could not keep the "Alpha" down. She returned at UFC 178 to fight Amanda Nunes. After getting dominated in Round 1, Zingano came back and finished Nunes in the 3rd round. Her next fight is against the best women's fighter in the world, Ronda Rousey. Dos Anjos started his UFC career at 0-2. He suffered brutal losses to Jeremy Stephens and Clay Guida. In 2014 RDA is the #1 contender at 155. He also knocked out former LW champ Ben Henderson. A great turnaround for RDA and big things to come for him in 2015. Matt Brown had lost 4 out of fights at one point and was on the verge of being cut from the UFC. He turned his career around and is a couple wins away from a title shot. After being cut from the UFC due to weight cutting issues in 2012. Anthony Johnson came back at 205 with a new look on fighting. Johnson came back and beat Top 5 205er Phil Davis and Lil Nog. Big things to come for Rumble in 2015. Dos Anjos' time is beckoning. After a 3 year layoff due to injury Dominick Cruz came back and steamrolled Takeya Mizugaki. That win earned him a chance to fight TJ Dillashaw and earn his title back. One of the best MMA stories of the year is Cruz's return. Maybe, the UFC learnt it's lesson in 2014. Maybe, the dilution of cards and the errors made will make for a 2015 to remember. Regardless of that, the year in 2014 was a rollercoaster and more signs that the UFC is taking off. Happy New Year—by the looks of things, 2015 is going to be a big one inside the Octagon. This article was collaboratively written by UFC lead writer MMA Genius and TSM Head writer Nisar Khan. Thank you for reading, have a sensational 2015 and stick with us for plenty more coverage. Fully reviewing the best of the UFC in 2014 and awards for all the moments in 503 fights throughout the year.